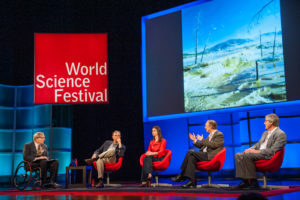 Since 2008, the World Science Festival has drawn scientists, artists, performers and the general public to venues throughout New York City each spring. The annual five-day celebration of both what science has accomplished and what it can inspire is the brainchild of Brian Greene, the Columbia University physicist and bestselling science writer, and Tracy Day, a former television news producer who is the festival’s executive director. It is a celebration both of science’s achievements and its slowly unfolding mysteries — and of the discipline’s ability to captivate and inspire scientists, artists and the general public. Year after year, Greene, Day and their team have curated an impressive and eclectic assortment of lectures and panels as well as theatrical, music and dance performances, along with outreach events from Times Square to Washington Square Park, reaching tens of thousands in person and hundreds of thousands on the web and in affiliated gatherings. 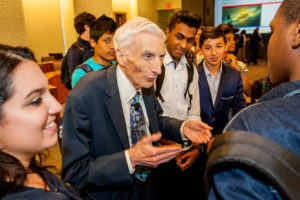 Since the World Science Festival’s beginning, the John Templeton Foundation has been a significant supporter of the event. Most recently, a three-year grant is partially funding the festival’s Big Ideas Series, a set of live events, webcasts, videos and supplemental materials showcasing diverse views from the cutting edge of scientific inquiry on topics ranging from dark matter and DNA splicing to probability, perception and time. The Big Ideas events — and the festival as a whole — are an exemplary expression of the mission of the John Templeton Foundation, which supports both research into the fundamental questions of life and the universe as well as outreach to the broadest possible audiences. They offer an exciting and inspiring overview of the latest discoveries about what we do—and don’t—know about the physical world, the origins of the universe, and the intricacies of the human mind. As the World Science Festival marks its first decade and looks towards the future, Day looks to growth from international expansion (the second annual Brisbane edition of the WSF attracted more than 180,000 people in March 2017) as well as year-round media made possible by a production studio for videos and podcasts that the Festival is building in-house.